"Will all those who believe in telekinesis please raise my hand!" is an old joke usually appearing prior to a lecture by someone who is skeptical about the existence of this paranormal ability. But there are many to whom the subject is not a joking matter, and who genuinely believe that they, or others are able to move or affect physical objects using the power of their minds alone. Belief in poltergeists and demon possession is ancient and common to many cultures. A classic poltergeist was seen as a mischievous ghost that moved things about, often causing havoc. In cases where no obvious trickery or natural cause was revealed, the idea that living people could somehow be moving inanimate objects by power of mind alone began to gain currency in the late 19th century. 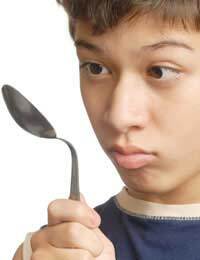 The original term telekinesis was later replaced in parapsychologist circles by psychokinesis. Perhaps it is no accident that these beliefs in the power of mind over matter appeared in an era when science was rapidly challenging and altering accepted views about the nature of the universe. Invisible forces like electricity and radiowaves turned out not only to exist all around us, but to be capable of feats that would have appeared fantastical or miraculous in previous eras. So the idea that the human mind may also be capable of impressive long distance power over the universe may have seemed to some like a natural next step. The Israeli Uri Geller is a household name around the world, and he is probably the most famous psychic to have publicly demonstrated apparent telekinetic abilities. His specialty is bending a variety of metal objects –keys, knives, forks and nails, and starting clocks and watches that had stopped, all by power of mind alone. According to believers, the effects have even been seen at long distances. Other acclaimed telekinetic psychics include a Russian woman, Nina Kulagina, who was filmed apparently mentally moving an assortment of objects that included salt shakers, crystal bowls and clock pendulums. Stanislawa Tomczyck, who lived in Poland in the early 1900s was reported to be capable of impressive telekinetic feats that she could only control under hypnosis, and which were claimed to stand up to strict test conditions imposed by Warsaw scientists. For modern aspiring telekinetics, internet sites abound with detailed instructions on how to harness your mental abilities in order to make paper psi wheels spin and straws placed on bottles revolve. Most scientists agree that there hasn't yet been any clear and decisive evidence presented to support the existence of telekinesis. Rigorous investigation of telekinetic powers has usually shown objects being moved by blowing, thin threads or static charges. Supposedly impressive feats where large objects move tend to be caused by variations of magicians' sleight of hand tricks. Amateur internet telekinetics may themselves be unaware of the basic physics that enable static electricity and warm air currents to move very light objects like straws and paper psi wheels. But some scientists have disagreed, for example Robert Jahn, a former Dean of the School of Engineering and Applied Science at Princeton University, USA. He set up the PEAR (Princeton Engineering Anomalies Research) lab in 1979. The main aim was to study how the mind could influence the behaviour of machines. Most of their studies involved attempts to override random number generators and they weren't put off when at first their results were disappointing. They just increased the number of subjects tested and coined the term micro-psychokinesis (MPK), to denote minds affecting machines in ways that can't be detected except by statistics. The believers claim that their statistics are indeed impressive, and that MPK is indeed an established phenomenon. Skeptics point out that the PEAR lab closed recently, without having convinced the scientific community to disregard the words of Benjamin Disraeli – "there are lies, damned lies and statistics…"
Neurodevices – The Future of Telekinesis? Medical devices that compensate for brain damage may sound like science fiction, but they're rapidly becoming both reality and big business, and eventually may lead to real telekinetic abilities for healthy people too. In the last few years, neurotechnology companies have come up with a pill sized brain implant that can read electrical brain patterns. This has enabled paraplegics to learn how to move a cursor on a screen, control a robotic arm and even turn their brains into TV remote controls. Healthy people may be less than excited about brain implants, but scientists working on similar projects are predicting that in 20 years we'll all be wearing computer headbands that can read our brainwaves non invasively, so it'll only be a matter of time till we can fly planes, drive cars and operate machinery just by thinking about it. It may put Uri Geller out of business! I'm Jennifer Sim from Malaysia and I get your contact via Google Search. I need help and I'm going to tell you about myself in summary: Ok, I have the ability to see Spiritual presence since I was a kid, then when growing up I can see things will happen in a distant future (meaning within 10 min or later that day) - this was when I was a teenager. Then in my 20's, I have the ability to read people's mind of problem they faced without them telling me as I don't even know them.. Then in my early 30's, I have the ability to move objects but only when I need it like if I'm in danger or under extreme emotional stress then it can trigger it without me concentrate on the object. Having said above, when I start to practice my Buddhism as form of meditation.... My mind calm down.... However, although my mind has calm down because I'm being mindful - I still can move the object without my concentration, I start to have back my so-called Psychic (that I can see in distant future of the day) and I start to sense people's problem without them telling me... My reason here is to ask for help. Help in a sense of my health - that is very important And, the Help that I want to Get to Know Myself - All the Abilities I have inside me. So that, maybe I can learn to control or somewhat to accept it and use it wisely.. Do you think you can help me? I really hope so. I don't mind to learn from distance, since I'm in Malaysia now. Looking forward for your reply. Many thanks.